Does your dog often feel shy, nervous, or worried? Is your dog uncomfortable meeting new people? Is walking past other dogs a big challenge for your dog? If you answered “yes” to any of these questions, private lessons in your home (within our service area) are the perfect solution for you and your dog. 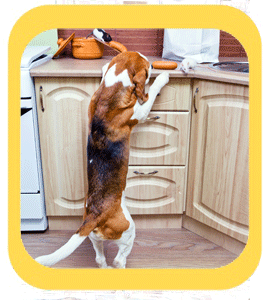 Our trainers will provide a behavior modification program tailored just for your needs! A: Changing behavior can be complex. There’s a lot to think about. For this reason, instead of having one long introductory lesson, which can be overwhelming for the dog (and for you! ), we start with two visits. In part 1 (the first visit), we'll talk about your dog’s concerns and work with you to design your training and management plan. A: Until we meet your dog, we have no way of knowing. After the two-lesson introductory package, we’ll have a much better idea of what level of training and management your dog will require. As much as possible, we design behavior modification programs in which you can do most of the practice sessions by yourself, without a trainer present. As your dog makes progress, our trainers will customize the lessons to meet your dog’s current skill level and give you updated homework to keep practicing on your own. Q: Are discounts provided for multiple lessons? A: Yes. After your introductory package, you can choose the lesson plan that works best for you. Lessons can be purchased individually or in discounted 4- and 6-lesson packages. Multiple lessons must be completed within 4 months or 6 months after initial lesson depending on the selected package. we can help you get started on your training and management plan. In the initial lesson, we'll talk about your dog’s concerns and work with you to design your training and management plan. A: Yes. After your introductory package, you can choose the lesson plan that works best for you. Lessons can be purchased individually or in discounted 4- and 6-lesson packages.